The return of major league baseball this week is a good reminder of how massive a story the Toronto Blue Jays’ playoff run was last fall. And more so, how a big, dominant, focal event can present PR, social and marketing opportunities for brands. In the case of the Blue Jays fever that gripped the nation, it presented a wide range of sidebar angles for brands that were not directly connected to the team or the sport (and, in some cases, who were also not official sponsors/partners with the Jays or Major League Baseball). If the ultimate score is to tap the hearts and minds of consumers, creative marketers can find ways to leverage something that’s not necessarily a direct connection for their brands, and journalists and social influencers are more than happy to jump on sidebar connections because it gives them new angles of the ongoing story to dig into and cover. But, being ‘part of the game’ requires brands to be scrappy and skilled to ensure their contribution is a hit. Very easily, a well-intentioned social post or guerrilla tactic can be construed as off base, or miss the mark altogether. Because consumers can smell inauthenticity, and a tactic that could have hit a home run might fall short if it doesn’t truly break through. This is not about you. This is about tapping into community spirit and comradery. Be part of the game, not an unwelcome distraction. Push the boundaries creatively and bring your agencies in early (now) to prepare for the playoffs. The best ‘spontaneity’ is well planned and well executed. As we look forward to more great brand engagement this season, it only seems apropos to acknowledge the hits of last year from sponsors to those just smart enough to ride the Jays coattails. I am certain everyone – including fair-weather sports fans like myself – can recall at least one standout brand activation that received consumer and earned media attention (and a few that arguably should have stayed in the dugout). Labatt launched the Blue Jays branded 6ix pack. Branded cans were sold at both bars and restaurants. WestJet Airlines sponsored the ‘flight deck’ in the stadium where spectators were able to stand, grab food and a drink, and watch the game. It was so sought after that people left their ticketed seats in the hopes of being closer to the game and catching a ball, WestJet style. Expedia.ca promoted travel packages that allowed fans to follow the team on the road. This was the first season/year that they had a dedicated page for these bookings specifically. Tinder: Although it’s safe to assume that most fans of the game expect to see their favorite players playing in the field, it’s less expected to see them simply playing the field. With the increased amount of athletes using the app, Tinder has modified its platform to include a verification marker. Booster Juice: It could be argued that sponsoring Jose Bautista isn’t the same thing as sponsoring the Blue Jays – but Booster Juice would beg to differ. With the success and rise of the Blue Jays, having the face of the clubhouse as your spokesperson certainly works to situate Booster Juice as a firm supporter of the team, backing them every step of the way. Spitz: If it’s not peanuts or cracker jacks, there’s a good chance that it’s Spitz. While the Blue Jays are not currently sponsored by Spitz Sunflower Seeds, they can often be seen chewing on a handful during their games. For anyone who has ever questioned the value of PR, Spitz is arguably one of the best real life example of ‘influencer seeding’ ever captured on television. 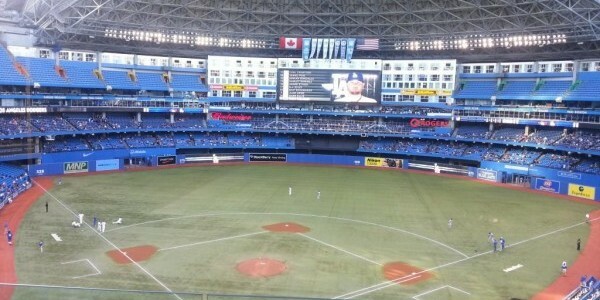 Play ball – and go Jays go!